This is the first volume in a new series, a companion to the Midland's acclaimed Fighter Command and Bomber Command Losses series. 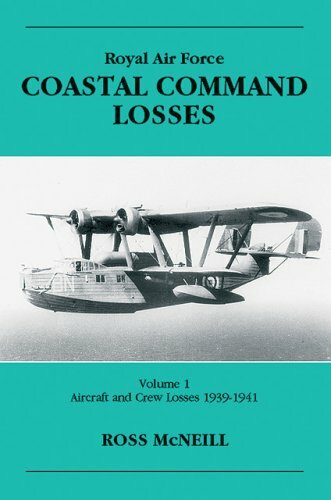 This details the aircraft and crew losses incurred by the Royal Air Force's Coastal Command squadrons operating from United Kingdom bases under the control of Coastal Command as either full units or as detachments from other RAF commands. Each chapter is introduced by a brief description of the campaign in which the units were involved, for the period under review. As with the books in the Bomber Command and Fighter Command series, the losses are sequenced chronologically. Both operational and non-operational losses. Each entry includes the date of the incident, the unit from which the aircraft came, the aircraft type and mark, serial number and the names of the crew involved. In addition the base from which the aircraft left, the time of take-off and the squadron code and letter. A brief description of the loss, and in the case of fatality, details of where the names of the dead or missing are commemorated, are also included.